Ex-New Zealand captain Brendon McCullum said he had a "moral obligation" to testify in court against former team-mate Chris Cairns. Cairns was cleared of perjury and perverting the course of justice last November after an eight-week trial. McCullum gave evidence accusing Cairns of twice asking him to fix matches. Cairns said McCullum's version of events was wrong and that he was "shocked" McCullum would accuse him of trying to recruit him to fix results. Cairns, also a former New Zealand captain, was found not guilty on all charges by a jury. Speaking to TVNZ, on the eve of the release of his autobiography, Declared, McCullum said: "Whether they believed me, whether they didn't, none of that really matters. It wasn't about a guilty or not guilty verdict. It was a matter of fulfilling a moral obligation I felt I had. "I was prepared to stand up, even under pressure and under fire from various quarters, and do what I thought was morally right at the time. "The last thing I wanted to do was be in a courtroom testifying against one of my old mates. It's certainly not how I was brought up as well." McCullum and Cairns became friends after playing for the Black Caps. 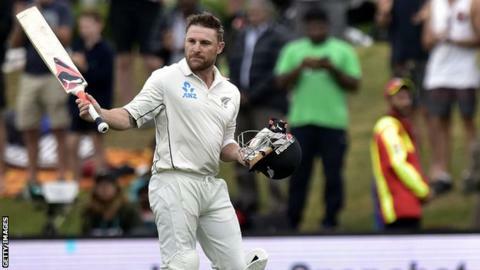 But McCullum, who retired from international cricket in February, added: "I'm sure he'll get on with his life, and I'll get on with mine, and let's hope they never cross paths."